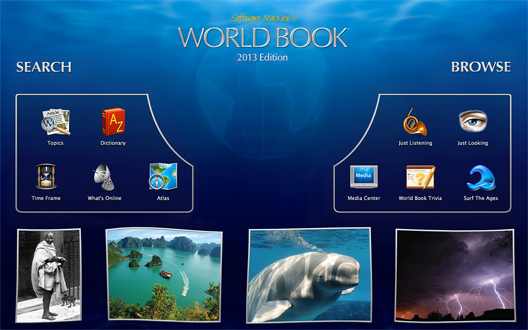 The wonders of our world are captured in this new edition of WORLD BOOK. See how a killer tornado is formed. Witness the notorious Berlin Wall coming down. Watch cheetahs running seventy miles an hour. See how ancient Egyptians made mummies. The journey begins here. Waterstream Home Screen. Extraordinary photos and video clips from the World Book Media Collection float by like leaves in a stream while matching music selections from Just Listening play in the background.